Lippy Lucie: I heart tape!! I have found my new fave nail art tool... STRIPING TAPE!! I love this stuff!! I think I will be doing a heap load of new manis with it, its just so fab! So I got my tape from EBay.. 10 rolls of different colours for £1 - bargain alert!! For my base colour I used Revlon Blue Lagoon which is a lush baby pastel blue which applies totally opaque with 2 thin coats. I used a simple Collection 2000 white for my pinky finger to spice the mani up a little more. I went for the gold tape as I think this compliments the blue and the white brilliantly. Now for ease of use i would rate this tape a 10/10, I didn't get myself in any sort of tangled mess.. didn't smudge my polish.. nada! You simple place the tape where you want it snip the edges and voilà! I used 2 coats of Seche Vite over the top once I had done my stripes and this held the tape in place overnight. However this morning I have noticed the sides have peeled off the nail slightly which I expected, so I will use a dab of glue next time to ensure this problem is eliminated! 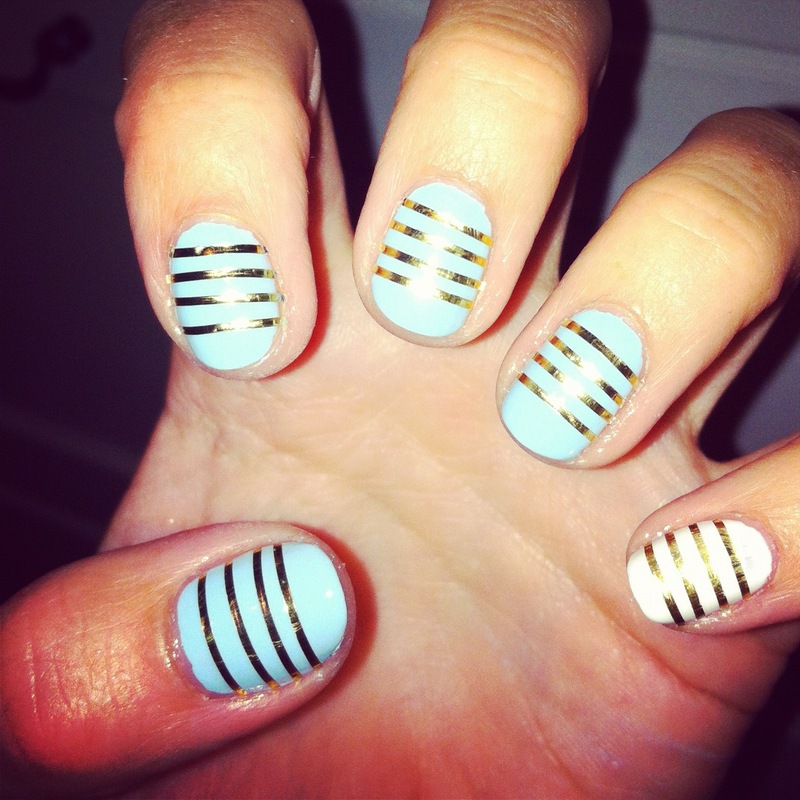 I would love some ideas for my next mani using string tape pleaseee!!! !